The fit of the pants after 2 tries was at 80% and felt more tweaking was necessary to achieve 100% fit before it could be considered a TnT. 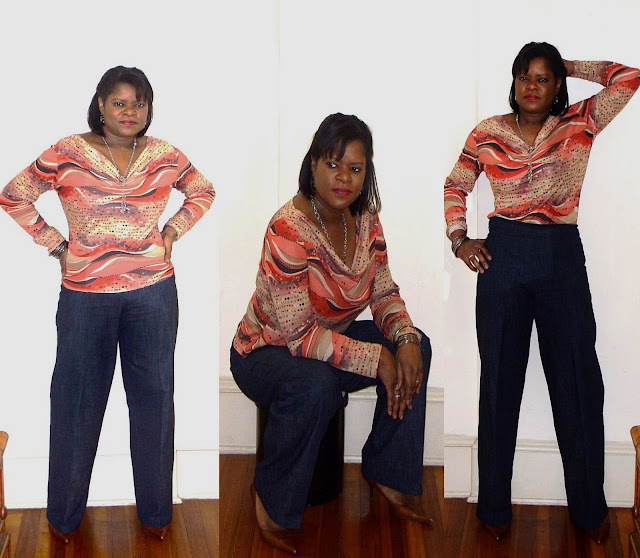 Initially the pattern pieces were altered using my rtw pants back in March wherein the pattern piece was altered to adjust the waist-line to crotch-line. 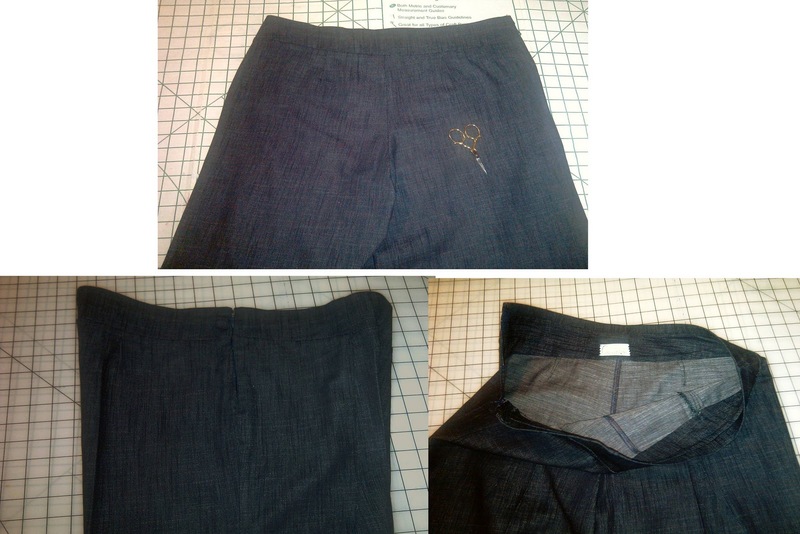 However, I noticed that the pants was too full in the hip/thigh area and the second time around & after viewing Palmer/Pletch's Jeans for Real People DvD, I learned to remove excess fabric from the hip/thigh area and grading back into the side seam for a closer fit. Talking to my Dear Sewing Buddies Andrea & Cennetta, we ended up discussing how similar our body shapes were in that we are narrow through the hip/thigh area as well as short in the waist-line to crotch-line area. It was enlightening to hear their modifications and gave me food for thought on how to make further adjustments on my third attempt of S4273. The additional alterations that I needed to get 100% fit was additional shortening of the waist-line to crotch-line area, pinching out more from the inseam & outside seam between the hip/thigh area and taking deeper back darts. The pinching from each of the areas was between 1/8" - 1/4", nothing drastic, but made a major difference. I believe I have achieved the right pant fit with S4273. The third pair was done in a lt-weight denim with one-way stretch and must say the pants fit so well and comfortable that they were worn twice in one week.... yeah I know TMI. A few close-up pics... all of the seams were serged. The pants are completed and love the fit. I used the remaining fabric to make McCalls 5978 which is still a work in progress and thought I'd share a quick pic of my Wilona outfit. Hoping All had a Beautiful Thanksgiving and looking forward to a weekend of leftovers. Getting a well-fitted pants pattern is a major sewing triumph, so congratulations on that! Both the denim and double knit versions are great on you. I know we will see more of these soon! Good work! I especially love the double knit outfit. Gorgeous fit. You really nailed it. Love the pants! The fit on those pants is exceptional! Nice job! Both pants are great. The double knit one was a good idea too. It's nice to know if you keep at it you can tweak it just right. I'm trying to achieve a perfect fitting pant and will keep at it. My challenge is I'm short waisted too but my rear is high in the back a bit. So the back curve has to be just right. Very nice job on both pairs of your new pants. I've been recently working on perfecting a pants TNT pattern. I hope to post my new pants soon. Those are so good looking on you. I like both versions, and especially the crisp denim. I have a secret crush on double knit, and the Good Times clip made me smile. The pants look great! The jacket with the pants looks fantastic too! Way to go!! Oh, yes, you've got the fit right, they look fantastic! I really need to get to grips with a proper fitting pants pattern, but I keep avoiding it. Both outfits are gorgeous. The pants look great! It definitely is worth the effort to get a wonderfully fitted pair of pants. Chile, your pants look dy-na-mite! Trouser jeans, yes!! Love them. The fit is great! Wilona, omg...haven't heard that name in forever! The outfit looks great. I loved me some Good Times, too. I missed this post! Your pants look fantastic. I think it's funny it took us both two tries to get the fit right on this pattern. But I feel like you, now I have a pair I love and will make again. I like the look of the double knit too.